Pleased as I was to read Taiye Selasi’s new novel, Ghana Must Go, I could not help thinking too little has changed since the writers I described in Ending British Rule in Africa struggled to get their books published in London in the 1930s and ’40s. Despite the many honors paid to Chinua Achebe on his death, the truth is that writers from sub-Saharan Africa still face great obstacles to getting into print, or, if published in their home countries, drawing attention on the world stage. Thus one of the “hot” African novels of 2013 may turn out to be this novel by a writer of West African parentage who was born in London, grew up and attended college in the United States, earned a master’s degree in England, and now lives in Rome. Like the writers I described in Ending British Rule, living in the urban west has given her a leg up on the ladder to publication. Of a recent Guardian list of thirteen “African writers” to keep an eye on in 2013, seven live outside Africa, with six of those seven in the United States. Of the other six, three live in South Africa, with its relatively well-developed publishing scene. There is in this fact something both to grieve and to celebrate. It is sad that sub-Saharan Africa, on the whole, still does not offer a hospitable climate for writers, and not only because publishing economies are not well developed and books too often unaffordable and unavailable. Significant portions of populations cannot read, and those that can may be more likely to read books published only in the colonial languages of English and French than in the rich array of native languages. The arrest of four journalists in Nigeria in April reminds us of another obstacle: life can be politically perilous for African writers. 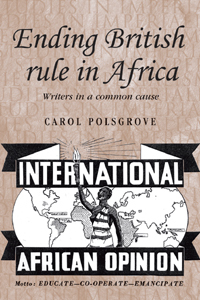 On the other hand, the increased visibility of work by writers of at least African origin is a cause for celebration. Growing up in Nigeria in the 1950s, though I heard the Bible read in Yoruba in church and sang hymns from Yoruba songbooks, the only book by an African writer I remember reading was a novel by white South African Alan Paton. Igbo writer Chinua Achebe’s pathbreaking Things Fall Apart did not appear until 1958, two years before I left Nigeria. At least now increasing numbers of writers in the African diaspora, experienced in the milieus of two or even three continents, are finding their way to publication. And the internet is opening doors to wider distribution of books by African writers. Booksellers on the web, like the African Books Collective, are making books from African publishers more widely available. A promising new audio book project called e-book Africa has launched with Senegalese writer Boubacar Boris Diop reading his novel Doomi Golo (The Monkey’s Kids) in Wolof. There is reason to hope that more African writers in the future will not need to grow up, study, or live abroad in order to find their way to publication and readers, both in their own communities and the larger world. Category: Anthropology, History	261 Comments.